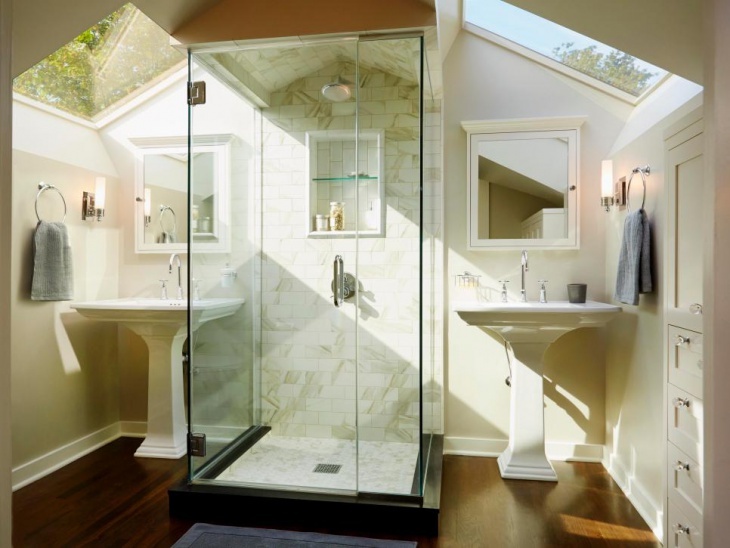 There are several benefits to using bathroom skylight. It is an overhead room feature that lets in the natural flow of light. It also adds drama to the interior design and it provides that special connection between the outdoors and the indoors. By utilizing this roof opening in your home design, you minimize the need to use bathroom lighting, which will let you save money on your electric bill. 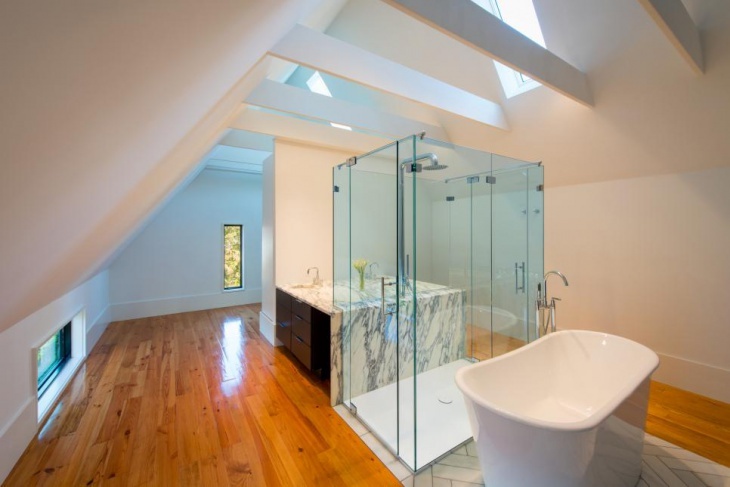 Bathroom skylights, therefore, allow you to live sustainably. You may also see minimalist bathroom designs. 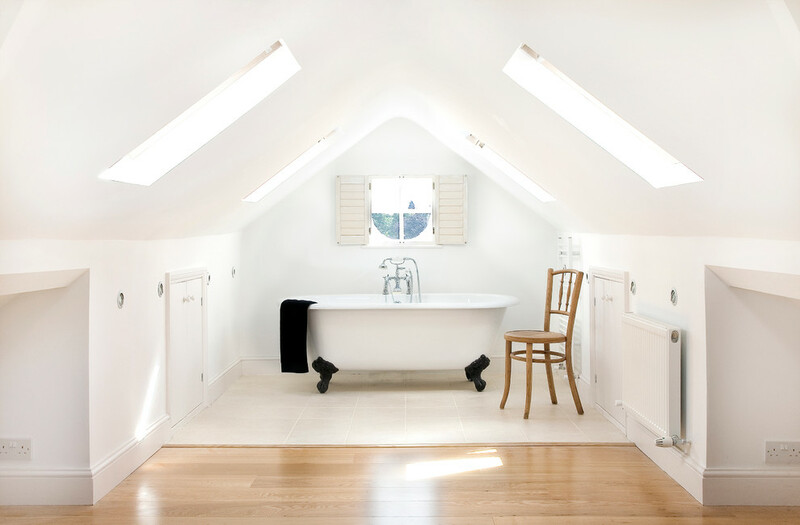 This attic bathroom is saved from being a boring space because the large skylight gives it a unique look and feel. 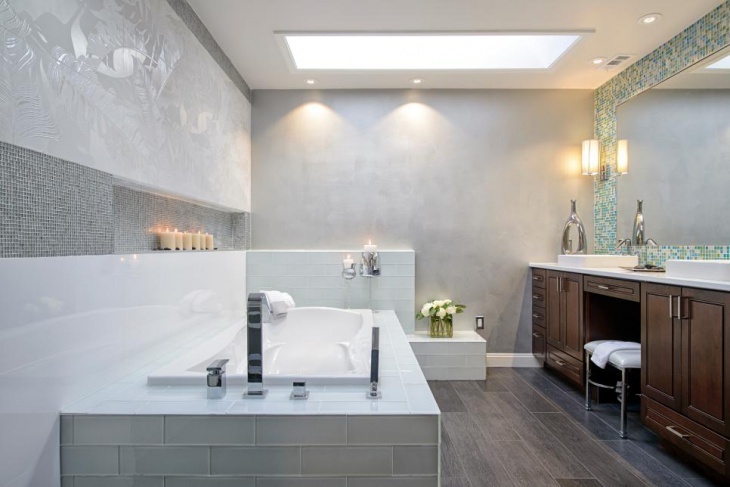 Imagine how glorious it would be to soak in that tub as natural light flows down on you from the skies above. This small minimalist bathroom is designed with functionality as the focus. 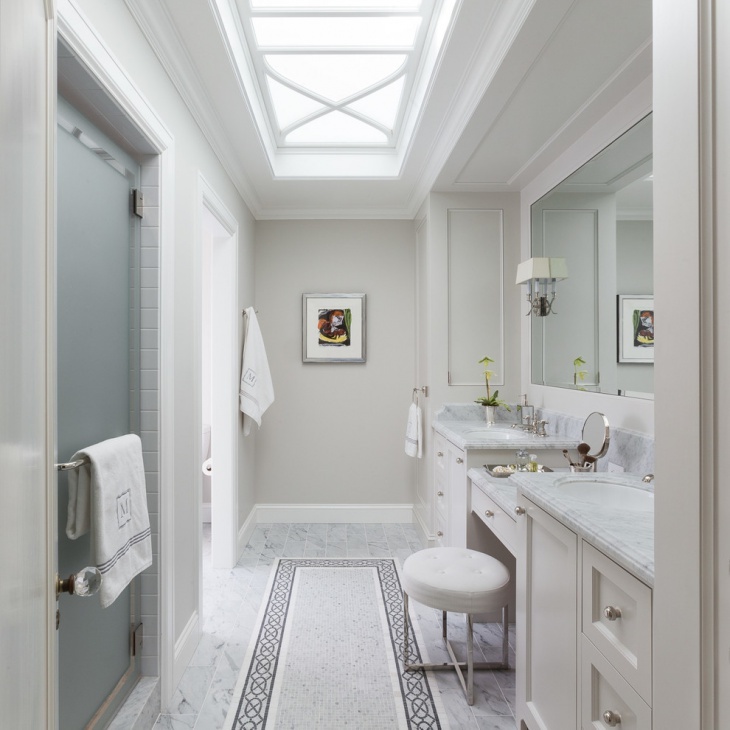 The skylight in the bathroom ceiling aids the slot window in providing plenty of good light into the small space. Lighting up this master bathroom with glass door and skylights enhanced the uniqueness of the interior design and the magnificence of the glass-enclosed shower area. 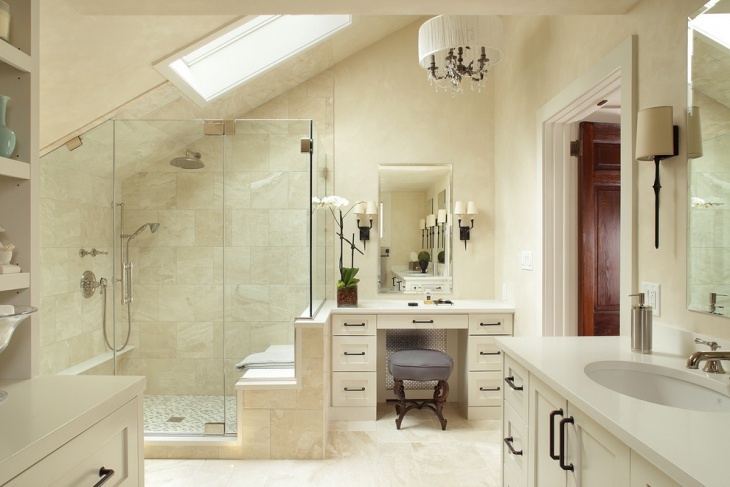 This bathroom is elegant and immaculate. Everything is light colored and that allows for the natural light provided by the skylight to be sufficient during a nice sunny day. 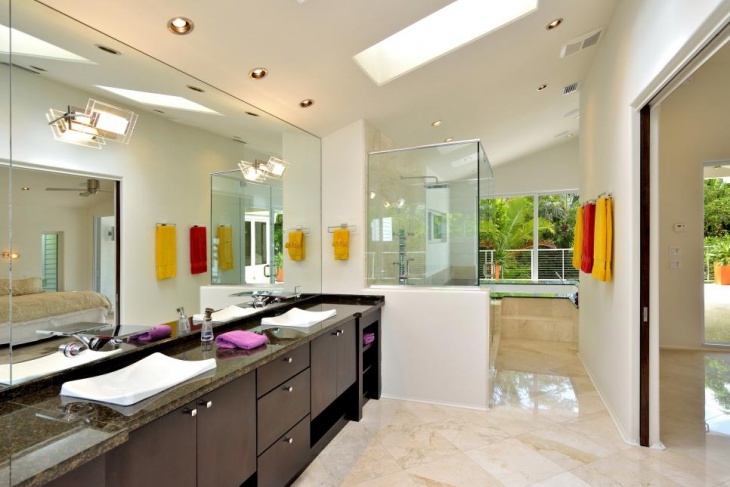 If privacy is not one of your main concerns, the design of this bathroom is ideal for you. The skylights and the windows let natural light in. 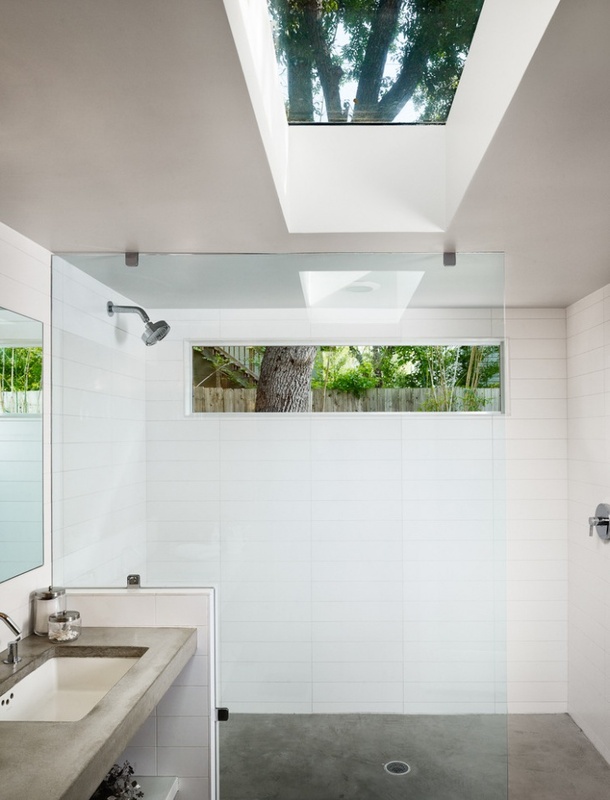 The skylights used for this bathroom are designed to provide a natural flow of light without compromising the privacy. 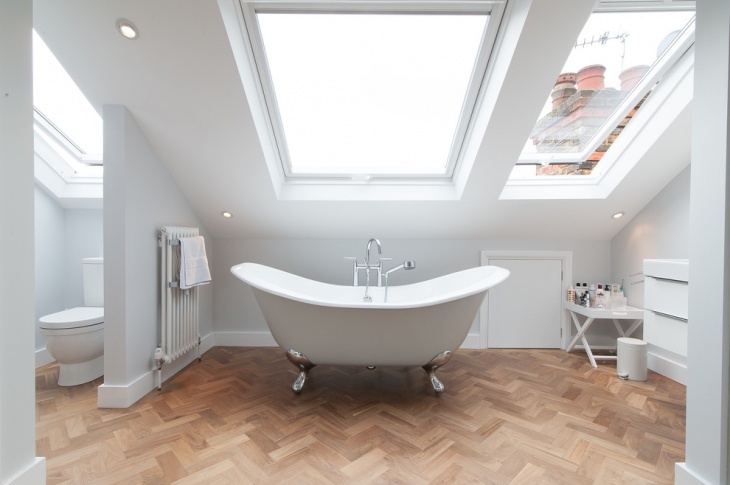 The skylights are fitted into the deep bathroom roof but not directly above any bathroom feature (tub or shower). 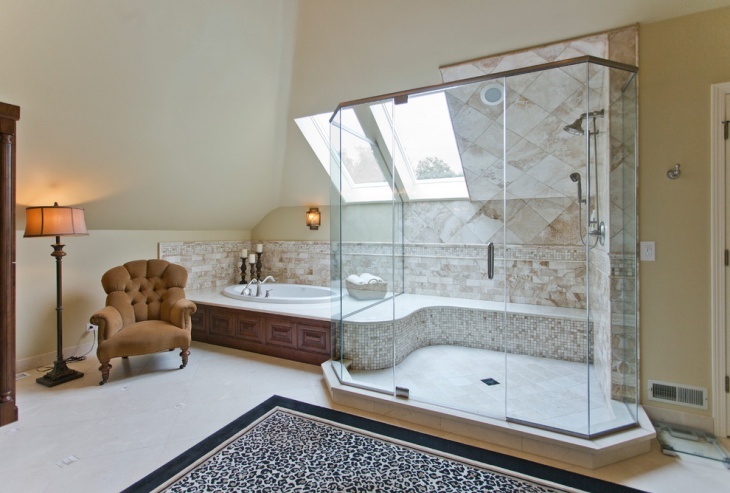 You can enjoy natural light during the day, and the views of the stars when you soak in the tub at night. The design of this bathroom is mid-century, which is why it looks so elegant. 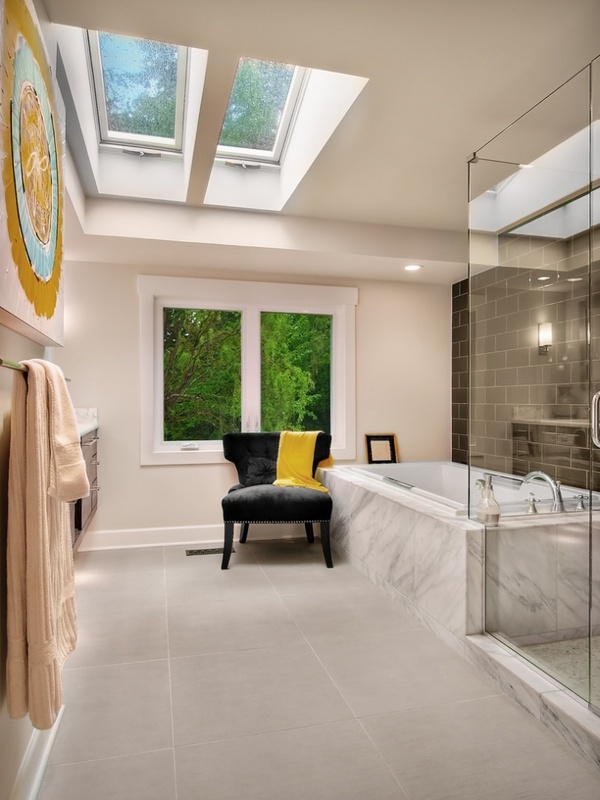 The addition of the skylights for the tub and shower areas allows for the room to bathe in natural and dramatic light. 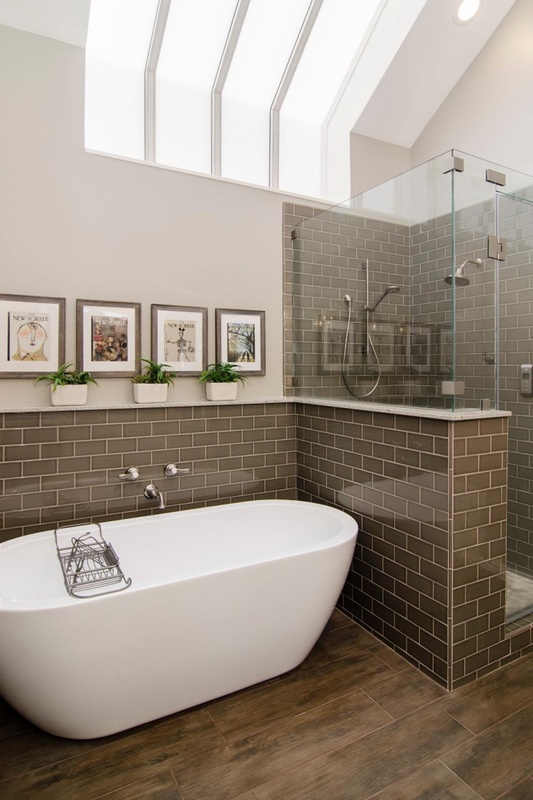 Not many people may want to convert their lofts into bathrooms. But in case you do, use of skylight would be an ideal solution to providing good lighting into this usually unused and neglected home space. 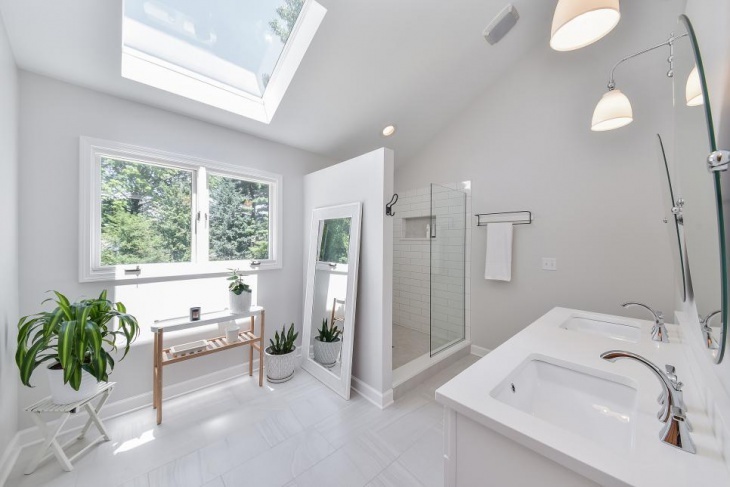 This bathroom, for instance, has been installed effectively with skylights that allow for the whiteness of the interior to make everything look so immaculate. The tub actually looks floating in a sea of clouds. A narrowly spaced bathroom need not look or feel crowded or suffocating. 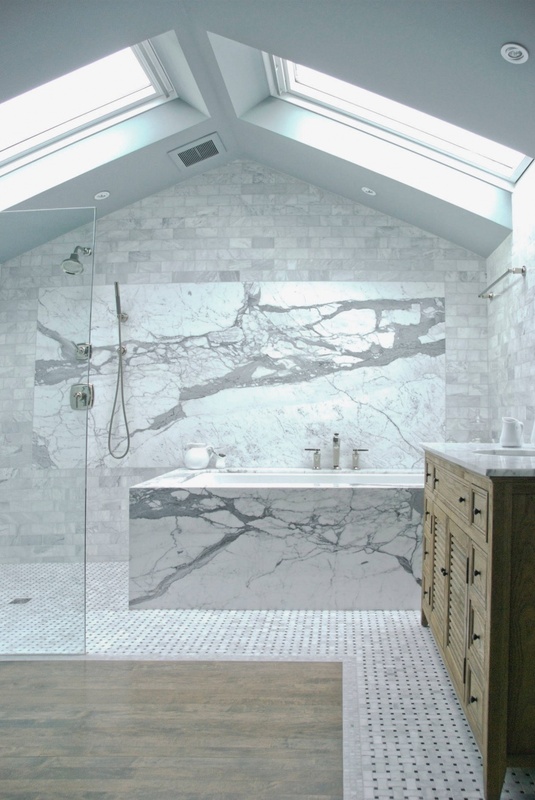 The long skylight design for this bathroom lights up the vanity space, making it well-lighted. To create the illusion of more space, a light color is used for the whole set. The combination of the natural light from the ceiling and the light color of the room allows for a very comfortable time to make yourself look beautiful. 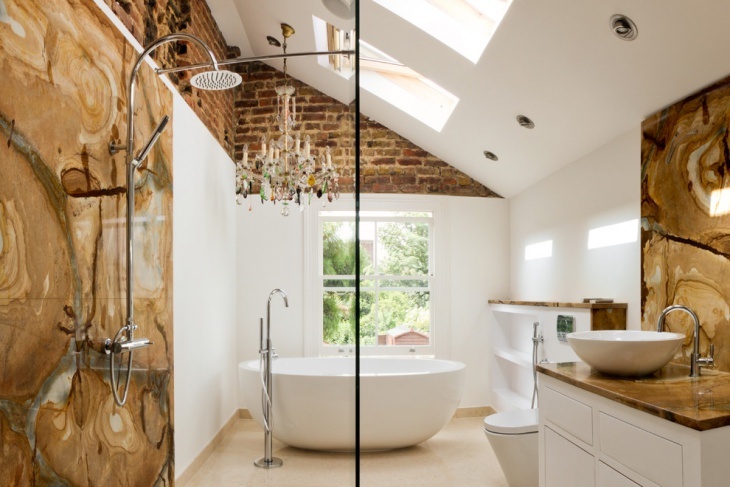 By adding a skylight into this bathroom, the natural light from the small windows is enhanced. This means that there is no need to open any lighting fixture during the day. 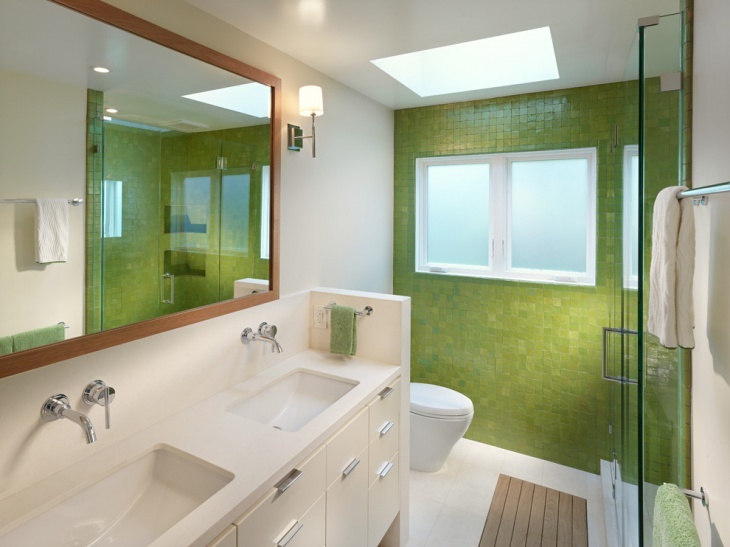 The accent wall is also more eye-catching because the light flows directly into it, making the green tiles shine in the midst of floating whiteness. 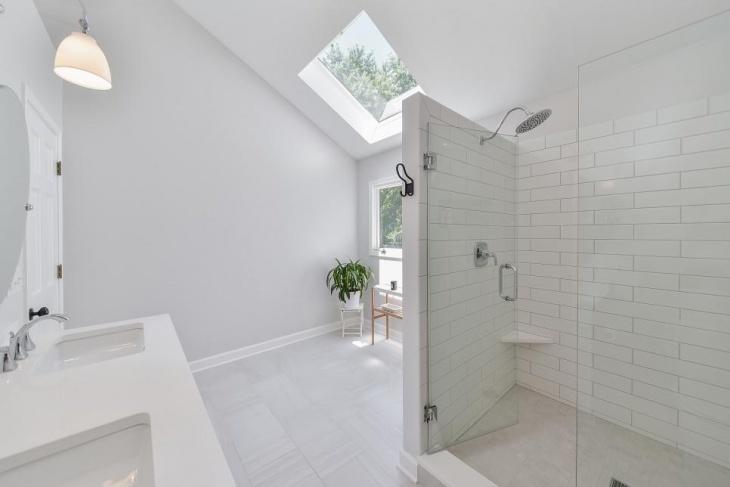 If you are thinking of a going for a bathroom remodel project, one new approach that you may want to consider is including skylights into your plan design. 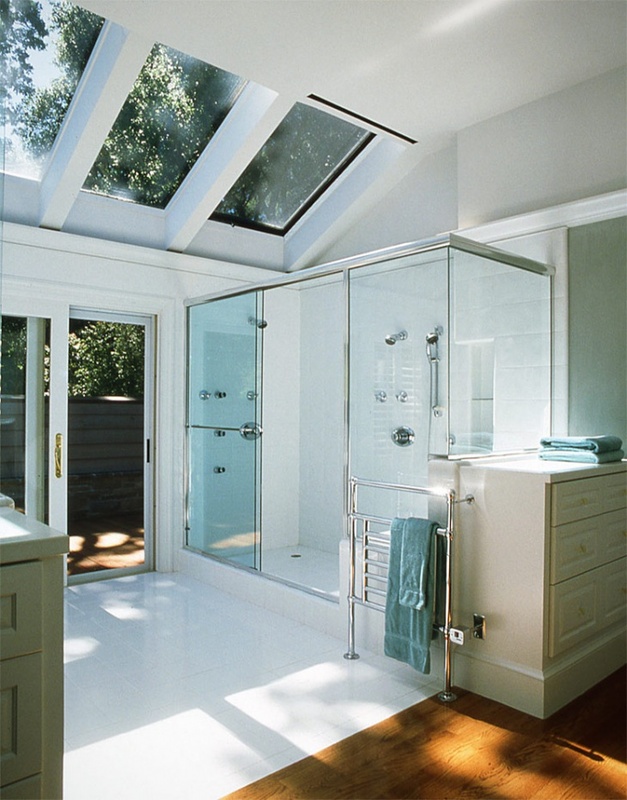 A skylight will let natural light flow in. It saves money and makes good use of the natural light.